This is not entirely true; on rare occasions we do consider other things, but the region’s age has blessed us with panoply of barns, and with extraordinary cemeteries where molder some of the most famous names in American history. 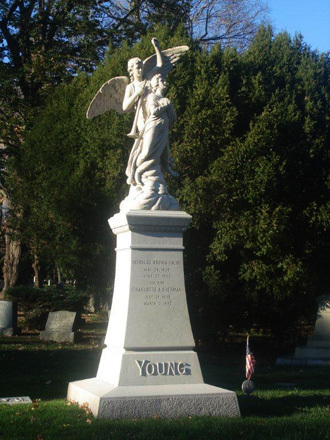 And, while I am in no hurry to take up permanent residence there, Swan Point Cemetery in Providence, Rhode Island is one of the most serene and historic walks to be taken in all of New England, if not America. Swan Point has such a proud variety of specimen trees (over 100) that visitors are handed a guide to help find them. This map is replete with such names as Robinia psuedoacacia (the Sassafras), and Acer palmatum viridis (the green thread-leaf Japanese maple). Where special trees grow is indicated by asterisks on the map. Affixed to the bark of these trees, one finds plaques with phylum, diameter, and approximate age. Aside from their rarity, they, and the more common native species that surround them, provide the visitor with a labyrinthine, eight-mile walk through a botanical garden…in peace…alone. Alone, but for the 200 species of birds that have been identified in these gnarly branches, and on these hallowed stones. Fearing no rebuttal, I say that Swan Point is the site of the most striking, creative, and beautifully executed grave markers to be seen on this planet. Obelisks are everywhere to be found. The shortest perhaps eighteen inches high; the tallest? Well, there are so many that determining the tallest might take a diligent visitor an entire month. 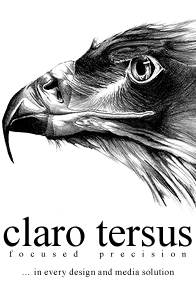 And, the variety of themes, the workmanship manifested, the flashes of imagination cannot be overstated. Grave marker for Co. John Slocum. The detail is a cape, sash, glove, saber, and kepi. 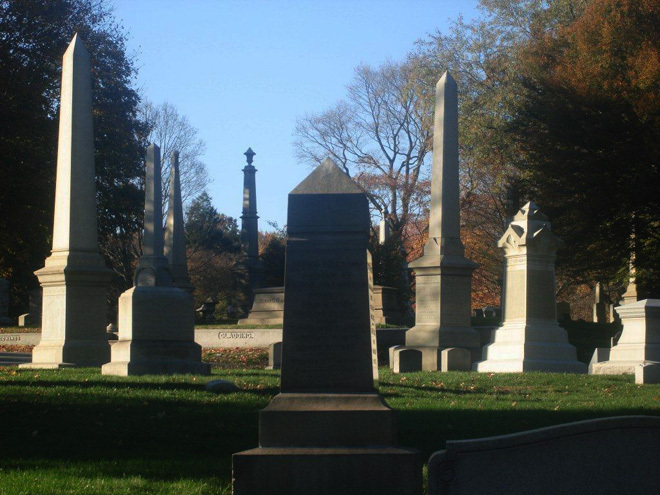 Slocum died on July 21, 1861, a few days before Sullivan Ballou. This end point for a thousand dead has features found nowhere else. The cemetery’s Megalith is claimed to be “the largest single stone ever to have been set in an American cemetery.” Eight feet square at its base, and seventeen feet high, the Megalith challenges the size of the stones of Avebury and Stonehenge. But, for all its above ground beauty, it is not what the eye sees that will quicken the visitor, but rather who rest below the tourist’s feet. Within its confines, Swan Point holds in repose Helen Adelia Rowe Metcalf, founder of the Rhode Island School of Design; Sarah Elizabeth Doyle, an early and important Suffragette, and an early sponsor of Pembroke College at Brown University; and, the Quaker, Elizabeth Buffum Chace, whose Central Falls home was a documented stop on the underground railroad. Here too, ten Union brevet generals sleep, as do four holders of the Congressional Medal of Honor - two from the same family. Twenty-three Rhode Island governors. Six hundred men who served their country in what Civil War era epitaphs call The Great Rebellion. The Base of the Sullivan Ballou obelisk. The quotation is the last paragraph of "Letter to Sarah." And here rests Major Sullivan Ballou, killed in action at the First Battle of Bull Run, July 29, 1861. 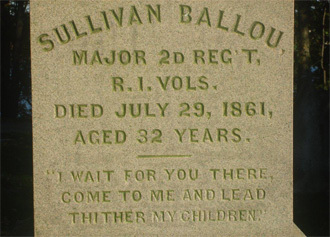 If you do not recognize the name Sullivan Ballou I urge you to find and nourish yourself on the letter he wrote to his wife, seven days before his death. Now known as “Letter to Sarah” it is the second-most compelling piece of literature to derive from the Civil War, bested only by the Gettysburg Address.